I had a surprise waiting for me this morning in church... a brand new microphone in a tiny velcro strap to put on my bridge. Previously we have had a mic on a short boom a foot or two in front of each cello. 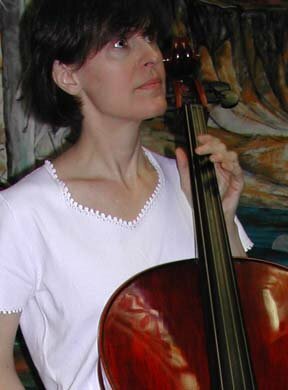 I must say, having the microphone actually on my cello made me uncharacteristically nervous. Oh, no! Now everyone will be able to hear those runs I fudge! Yes, I confess. If there are more than 4 sixteenth notes in a quarter note I kind of slide the notes at an appropriate rate to land in time on the next down beat. My eyes still blur when they see too many notes crammed into too small a space. When I told DH about the new arrangements he made that light-bulb-turning-on face and said that the sounds from the orchestra *had* been much clearer that morning. Fortunately, the only thing he remembered standing out was a ragged clarinet passage. Phew. The AV support at this church is phenomenal. There are at least two big mixers "out front", one on stage left and one in the middle of the auditorium. In addition, there is a room full of monitors and I have no idea what kind of electronic equipment back stage. In addition to two super-sized screens for the congregation to watch videos and live close-ups of the pastor, choir, orchestra, and other performers, there are small monitors at the front of the stage and a larger one (36 in. or so) in front of the orchestra and choir where they project lyrics and program prompts for the performers. And the choir wears FM frequency radios that feed from the auditorium so that they can hear what things sound like out there. Amazing. I haven't counted the choir members, but it's a big choir. More than 60. Maybe close to 100. (Now I'll have to count to see how good my estimating is.) In orchestra we have 4 violins, 1 viola, 2 cellos, occasionally more or less. Flutes, clarinets, bassoons, oboe, trumpets, trombones, tuba, drum set and guitars, piano, keyboard(s). Those AV guys must be really good. I can't imagine making a beautiful sound out of the joyful noise of a separate feed on every instrument. I hope they are good enough to turn my cello down during my most spectacular flubs. Wow, that is an impressive orchestra and choir! (The last time I played at a church there were 4 musicians and 4 choir members. )Are the AV people also recording it so you can listen to your performances? I'm pretty sure not. They record the sermons to put up on the web, but without music attached. Undoubtedly there would be licensing issues otherwise. OTOH, I'll bet they made a tape of the Easter pageant for internal use. I didn't play in that because I was out of town. Funny, I've played at Christmas and Easter for at least 6 years, and never seen a show. My back is always to the stage, and I never see the recordings. How nice that they go all out on the music at that church. I've never really seen more than the typical orchestra & choir at any church I've attended.